If you lose games by hanging pieces, our new game ‘route planner V2.0’ is something for you! With this game you learn to have a better control of the potential of the pieces and you will improve your board visualization skill. It's all about the way you visualize the movement of the pieces in your mind’s eye. I was 35 years old (pretty late…) when I found out that my board vision was limited. 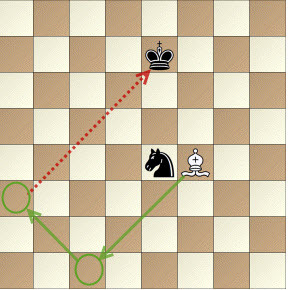 I solved this issue, but without Chessity that was very hard to do :-) But anyway, within a few months the calculating task becomes easier and also my “chess” memory became much stronger. From that point I started to win more games. Chessity believes that an important foundation of a chess player is the way your mind can visualize the chess board. We believe that it is a trainable skill. Click here to start the training and stop losing your pieces! I believe this is the first site in the entire world to have such original tool for training. My compliments to you and your staff for devising such useful exercise. I love it, and it is really hard, especially when there are 7 Black pieces on the board. Thanks for that great training tool. Please correct exercices with fixes. Very interesting idea. But it's too much of a jump from 1 piece to 3 or 4. 1 piece was easy to remember, but 3-4 is impossible for me. It would be better to increase it 1 piece at a time. It would be challenging enough for me to remember where two pieces are. Thanks, did you play the route planner tpr? That game should learn what your level is and help you with the right exercises.